Whether or not you are ready for it, Fall is just around the corner. As the days get shorter, and it starts to get much tougher to wake up in the morning, there are many things around the house that need to get done before fall. Wrap up the summer veggie garden hoses and put the outdoor patio set away! 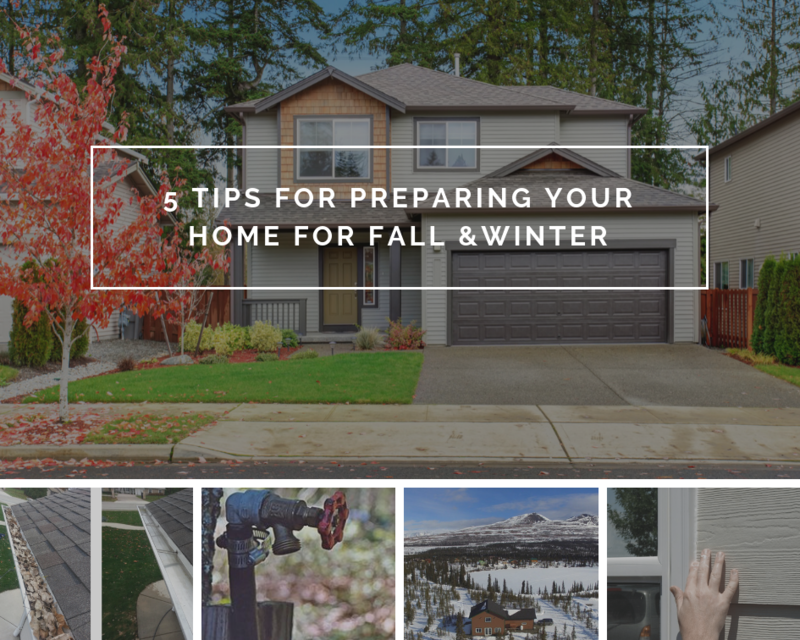 We have created 5 tips to get your house ready for Fall and Winter. Water can potentially be a home’s worst enemy. Leaves always find a way to fill your eavestroughs and downspouts whether you have a bunch of trees in your yard or not. Full gutters can be a nuisance and create an invitation for critters to nest in them before they attempt to get in your attic space. Scraping out and cleaning the gutters can be a horrible job depending on the height and slope of your roof plane. However, it very important to complete at the end of each Fall. If you are uncomfortable cleaning them yourself, get a quote from a local professional. Your home will be happy because of it! Checking the perimeter around your windows and doors can prevent cold air from getting in your home and prevent warm air from getting out. Having a good seal is extremely important around all exterior openings and will create a much more comfortable home and save you money by wasting less energy. I strongly suggest talking to your local building store to ensure you are using the correct caulking sealants for the correct use. There is no doubt that weather stripping can lose its effectiveness with age. It is a good idea to do a visual check every couple years and inspect around the exterior doors, windows, and garage doors to ensure there are no cracks and deterioration. It is important to make sure you have the correct weather stripping for the application before you replace the existing. There is a difference between exterior doors, garage, and window weather stripping as well as a significant difference between foam and rubber stripping. Adding weather stripping to attic and crawlspace openings is also a good idea to help block any potential drafts from entering your home. There may be nothing worse than in the middle of a November’s torrential downpour then to feel a few drips of water gently dripping on you head. Drip… Drip… Drip… this certainly is not a fun experience! Roof shingles are made in many different weights and the heavier a shingle is, the longer it will last. The average life expectancy of shingles is between 20-30 years if installed properly in a mild climate. Severe weather, attic temperature, critters, and a ventilation may all contribute to the life expectancy of shingles. Inspect the roof regularly and check around vents, flashings, and chimney to ensure there are no crumbling bricks or critters creating a mess. Examine the gutters for any granules which may be a sign of heavy wear on your roof. If you have a metal or tiled roof it may be a good idea to get an inspection done by a professional. It is also very important to check the underside of your roof for any water damage, holes and or any mold. Check attic insulation to ensure that vents in your soffit are not blocked. This ensures proper ventilation in the attic and healthy air! The faucets you use outside in the summer to keep your veggie garden soaked, plants watered, and grass green are all susceptible to freezing in the winter. If proper care is not taken to shut-off and drain these lines before winter, it can lead to pipes and faucets bursting or cracking and can create a huge, potentially expensive, disaster. Walk the perimeter of the house and locate all exterior faucets. Remove any attached hoses and drain any residual water. Once the water is turned off inside, open the outside faucet to let it completely drain. If you don’t have shut-off valves or can’t find them, contact a licensed plumber to have them installed. A professional plumber can retrofit the standard faucet with a frost-free faucet that allows you to leave the water turned on year-round. If you have access to the run of pipe that goes outside, adding pipe insulation around it is bonus protection and will also help keep condensation down in the summer months as well.